Even though Recovery Mode can fix many little system problems on Samsung, sometimes Samsung Galaxy might also gets stuck in Recovery Mode and can not turn on and go back to normal state. So, what should you do to get Samsung out of Recovery Mode if your Samsung phone gets frozen on the Recovery Mode screen? Don't hesitate to read on to get the effective way to fix Samsung stuck in Recovery Mode issue in this post. If you boot your Samsung into Recovery Mode in a proper way, you can simply get your Samsung out of Recovery Mode by choosing "reboot system now" option with Volume Up/Down buttons and then press Power button to confirm on Recovery mode. And this way is available for all Samsung devices, including S9+/S9/S8+/S8/S7/S6/S5/S4/Note 8/Note 7/Note 6/Note 5, Samsung Galaxy S9+/S9/S8+/S8/S7/S6/S5/S4, Samsung Galaxy Note 8/Note 7/Note 6/Note 5/Note 4, Samsung J3/J3 Pro, Samsung Galaxy A9/A8/A7/A5 and etc. Step 1. Turn off your Samsung Galaxy Note S/Note if it is on. Step 2. Press and hold "Volume Up + Home + Power" buttons at the same time till your phone is on, then your Samsung will enter Recovery Mode. (Note: For some Samsung phone, you might only press and hold "Volume Down + Power" buttons at the same time to enter Samsung Recovery mode. Step 3. Then you can highlight any options from Recovery Mode with Volume Up/Down buttons and confirm it with Power button. Step 4. After that, you can exit Recovery Mode on Samsung by choosing "reboot system now" option with Volume Up/Down buttons and confirm your action with Power button. Then your Samsung phone should be restarted and go back to normal screen soon and you can operate and set up your phone according to your will. If you want to restore your Samsung to factory settings with Recovery Mode, please remember to backup your Samsung data beforehand or this will erase all data and settings from your Samsung phone. Luckily, you can also recover lost data from Samsung after factory reset, too. You can learn more about Samsung Recovery Mode with the above link on the way to enter Recovery Mode. Sometimes, if you follow the normal way to get Samsung out of Recovery Mode but Samsung can not restart as normal as expected. In this case, we'll see that Samsung gets stuck on Recovery Mode. So how to fix it? The professional Android recovery tool - Broken Android Data Extraction could be very helpful for you. The Broken Android Data Extraction can help you fix Samsung stuck in Recovery Mode issue with one click. What's more, it allows you to extract and recover data from Android phone under any stuck situations, such as Android stuck in Recovery Mode, Android stuck on boot screen, Android stuck at black screen, Android stuck in Download Mode and etc. Different kinds of Android data can be recoverable, including contacts, messages, call history, photos, videos, music and etc. And it is compatible with all Android phones, including Samsung, Huawei, LG, HTC, Sony, Motorola, ZTE, OPPO and etc. 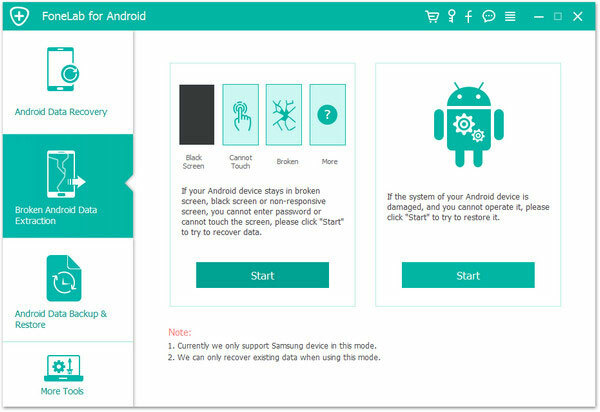 Free download the Broken Android Data Extraction program on your computer to get your Samsung out of Recovery Mode now. Step 1. 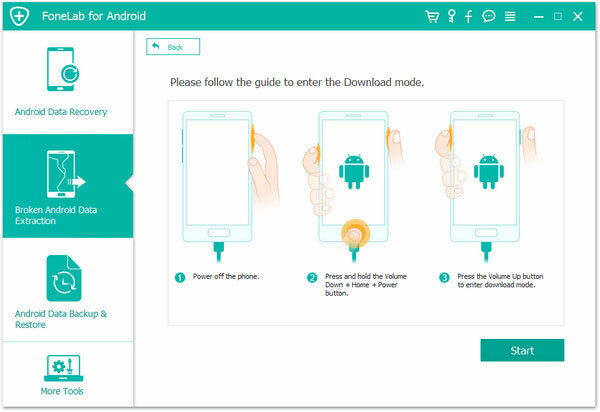 After downloading the Broken Android Data Extraction program on your computer, please install and launch it, and connect your Samsung phone to computer with a USB cable. This program will automatically detect your device soon. Then switch to "Broken Android Phone Data Extraction" option on the interface and hit second "Start" option to restore your Android phone's problem. Step 2. 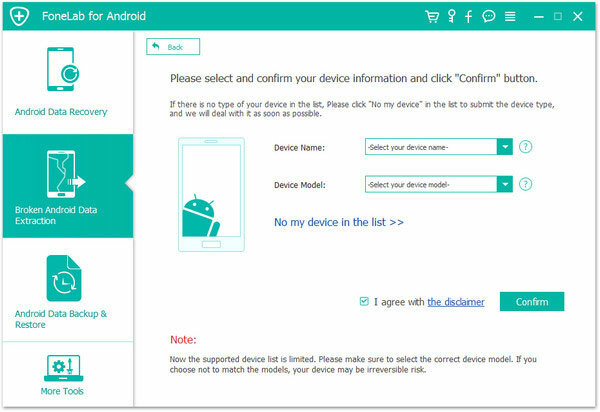 Then please choose your device name and device model from the drop-down menu and click "Confirm" option to move on. Step 3. Then please boot your Samsung phone into Download mode and click "Start" option. To do so, you can follow the screen prompt: 1)Power off your phone with Power button; 2) Press and hold the Volume Down + Home + Power buttons simultaneously till it is on; 3) Press the Volume Up button to enter Download mode. Step 4. When your device gets into Download mode, the program will download the recovery package to restore your Samsung and get it back to normal. When the whole process is finished, your device will be restarted and get back to be a normal one.